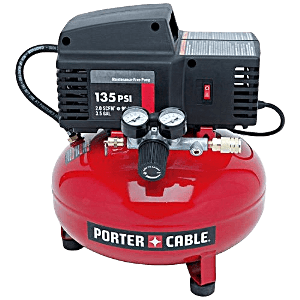 Air compressors have been used for years to power pneumatic tools such as paint sprayers, impact wrenches and staplers, among others. If you're in the market for a compressor, and you're a carpenter, a painter, a builder, a home remodeller, or just someone who likes to build s**t - you're in the right place. Whether you are a contractor, technician or homeowner, you will probably need a compressor for bodywork, framing, roofing, automotive repairs, finish work or home applications such as inflating tires. 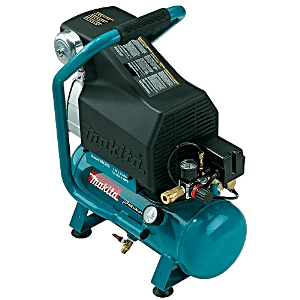 With all the options out there however, how to you choose the best air compressor for your situation? 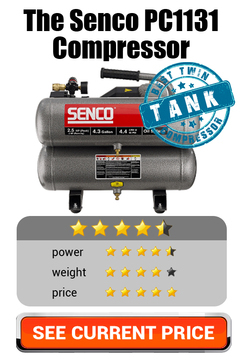 It's simple - read through a couple of unbiased air compressor reviews. We'll show you which considerations you'll need to look at, and then show you reviews of the best in the biz. Are You In a rush for the low-down on a specific type of compressor? Need some tire inflating? read the best 12volt air compressor guide ﻿right here, and be amazed. At 49 pounds, the CAT 6310 is easy to transport around and it is among the quietest compressors in the industry with only 60 decibels, less than the 65 decibels of sound in a standard conversation. It's oil-free piston pump will minimize wear and tear and maintenance costs, even though it comes with 1-year warranty. Just in case you were wondering: its silent nature has not effected its power; the powerful pump delivers 3.8 CFM at 40 PSI and runs on a motor with 1.0 Running HP and 2.0 Peak HP to ensure greater performance with minimal wear and less noise. Its electric-powered and works on an electric outlet with 110 volts, meaning you can take it anywhere with power and it will deliver. 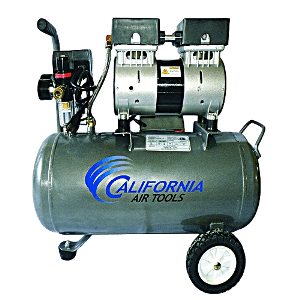 The compressor comes with a 6.3-gallon steel tank for better air intake and wheels to increase portability from one project to another. The necessary water trap that gets rid of excess moisture in the air, which helps it in lasting longer than most models. With a motor that runs at 1680 RPM, the CAT 6310 is perfect for quiet workplaces. Weighing in at 81 pounds, operating at 79 decibels (of sound) and delivering 90PSI of power at 4.2 CFM (and 40 PSI at 4.8 CFM) means this 2.5 horsepower compressor packs a real punch, providing you with the oomph’ that you need to get any job done! The cast iron pump is oil-lubricated to ensure smooth operation and less wear even in tough working conditions. The Big Bore cylinder, piston and a motor that runs at 1730 RPM producing only 79 decibels means this unit has increased air intake and a quicker recovery time. Thanks to the Big Bore technology, the compressor produces an insane amount of power in a smooth and reliable manner without disturbing the entire street and causing hearing problems! 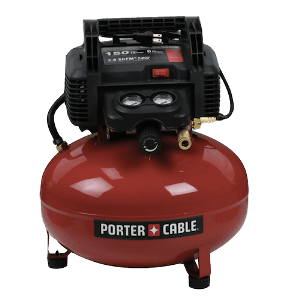 With a roll bar handle for portability and extra protection, the compressor is very durable and tough yet it comes with a 1-year warranty just in case things go wrong. Thanks to its vertical pancake-shaped tank (less than 19 inches wide) and weight of 26 pounds, this unit is increasingly easy to store and move around as you work - no surprises its the number one pancake compressor on building sites across the USA. At 82 decibels its not whisper quiet by any means, but this is just a trade off having it so lightweight and portable. 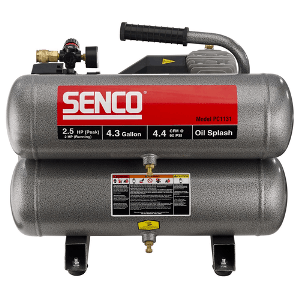 With a tank that holds 3.5 gallons and a pump that puts out 2.0 CFM at 90 PSI and 135 PSI maximum, the compressor has a faster recovery and longer run time especially when used for light applications like general inflation, small roofing or framing projects and powering smaller pneumatic tools. Its low AMP motor needs a 120Volt outlet which means that the compressor just works fine on normal household circuits and in cold weather situations. 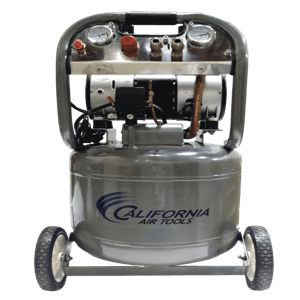 Although the compressor has a durable oil-free pump for low maintenance and long life, it also comes with a 1-year limited warranty on unit components. QUESTION #1 - What The *Heck* Do You Need It For? I think you get the point now - choose based on the task, not based on the type. QUESTION #2 - Power Supply - Gas vs Electric Compressors? Electric compressors operate on the standard household voltage of 120 Volts or a vehicle accessory outlet of 12V. However, larger models that exceed 2 running HP (horsepower) may need an outlet with 220-240V. Electric compressors don’t emit fumes, are quiet and they require less maintenance hence they are the perfect choice for indoor uses. QUESTION #3 - Portability and Size - Large vs Small Compressors? Portability and size are important considerations when buying compressors. Compressors can either be portable or stationary - each with its own advantages, and drawbacks. Portable compressors come in different sizes and shapes depending on your needs. There are small compressors which are easy to carry around. On the other hand, there are large compressors which have wheels to allow you to move them around your work area. If you plan to use an air compressor for light applications like inflating sport equipment or tires or for powering finish nail guns, you should choose a light-weight and portable compressor. Don't forget to make sure it’s oil-free and has tank that can hold 2-6 gallons. This way you'll having something mobile which wont tire you out when working. 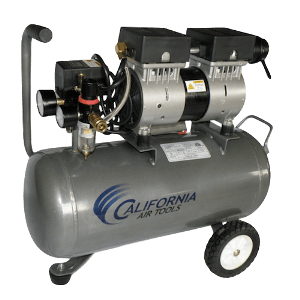 For more demanding applications, you will require a portable compressor with more power and a tank that can hold 4-5 gallons. Stationary compressors are commonly used in workshops and garages since they need to be attached to a fixed area. Typically, they run on 4-10 HP motors and come with tanks that hold 60-80 gallons. Most stationary compressors are powered by electricity and they are wired directly into the electrical circuit of the building. If you need greater performance but less movement in your garage or workshop, then you should choose a stationary compressor. It will work well with a variety of simple air tools in a workshop or garage. HP is the power produced by the compressor’s motor or engine. A higher HP improves the recovery time of the compressor because it makes the compressor pump more efficient when it comes to filling the tank with air. However, a higher HP does not necessary mean that your paint sprayer or nail gun will become more powerful or faster. So, what’s more important? You should consider the CFM and PSI ratings of the compressor if you want extra power and greater performance in your pneumatic tools. Note that you should check the “Running Horsepower” as opposed to the “Peak Horsepower”. Like most tools, compressors are not a 'one size fits all' solution. Your neighbour may need a different type of compressor to you, and you may need a different type of compressor to a building contractor. 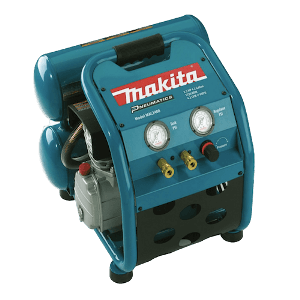 Choosing the best air compressor for your individual circumstance lies within knowing about the different classes. 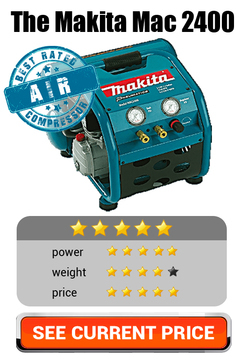 Before you dive into air compressor reviews, figures out what TYPE of compressor you'll need! Our favourite pancake compressors are the Porter Cable compressor and this model from Dewalt, however you an read about the 4 best pancake compressor right here. 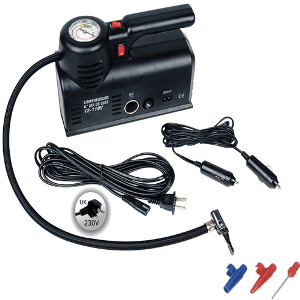 A tire inflator should be an indispensable part of any vehicle owner’s toolbox - if you don't have one already, head on over to our tire inflator review page here for the best 12 volt air compressors. 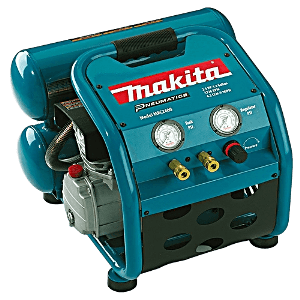 If you are looking for innovative and high-quality air compressors that are sure to stand the test of time, Makita is a name that you can trust. The company boasts of an extensive and impressive range of mechanical and electrical tools that are built for both residential and industrial applications, including various models of compressors. The Makita name has also grown to become a stalwart in the manufacturing and construction industry, thanks to being in the industry for a significant amount of time now. 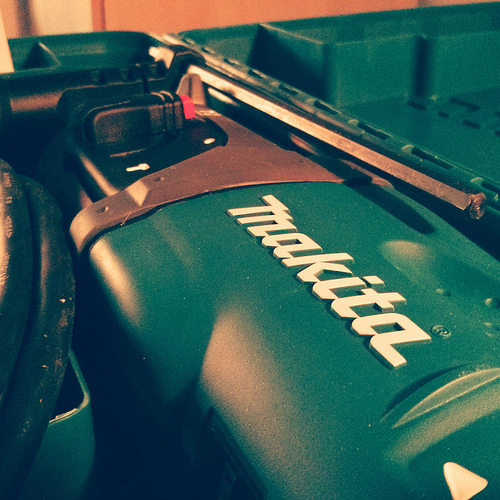 As far as brand reputation goes, Makita has definitely earned its stripes. You can’t go wrong picking a Makita tool. These machines are built to last, offering excellent performance and more than satisfactory results for your projects. 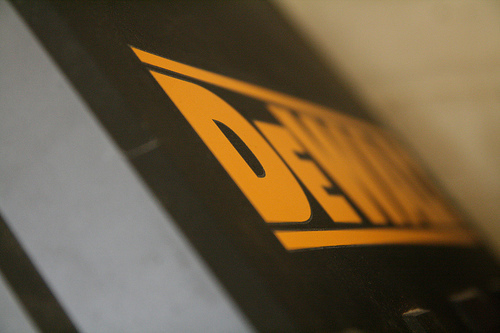 Stroll through your handyman’s store and one of the first names that you are sure to encounter is DeWalt. And for good reason, DeWalt is a brand that has proven its mettle in producing a multitude of home-grade and industrial-level tools, including tire inflators, compressors and hand-operated tools like drills and power saws. Although you’re bound to find DeWalt’s tools comfortably snuggled in a DIY enthusiast’s garage, you will also find these tools in any industrial facility. No matter what kind of tool you need, for whatever task you might have in mind, you really can’t go wrong with choosing DeWalt. Whatever machine or device you choose to buy from the company, you can rest assured you’re buying into a legacy that’s 175 years in the making. 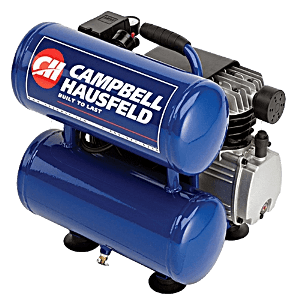 Campbell Hausfeld boasts of unparalleled experience, which has allowed the company to produce the highest quality machinery in the world. 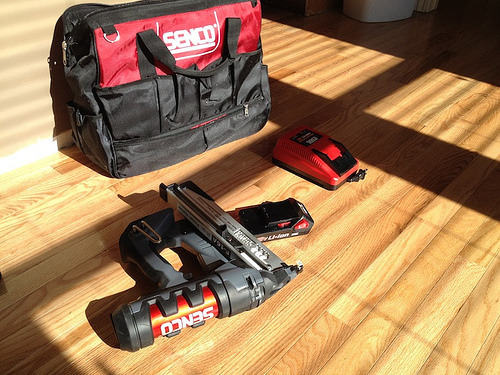 Right from the very beginning, SENCO has shown an extraordinary commitment to developing cutting-edge tools and machines to solve any problem in a wide variety of applications, from home construction, machining, and industrial jobs. SENCO first burst into the scene when in the 1930s, the company developed an innovative solution that had the ability to reduce the noise profiles of automobiles by canceling out the source of vibration commonly found in vehicles of the time. This resulted in a better, more comfortable driving experience for thousands of car owners. Today, SENCO is still committed to its innovative methods, developing helpful solutions that make work in both the industrial arena and the residential environment easier, faster, and safer than ever. Established since 1906, Porter Cable boasts of a long history of designing and manufacturing advanced tools built for the everyday handyman, as well as complex facilities requiring the very best machines and equipment. 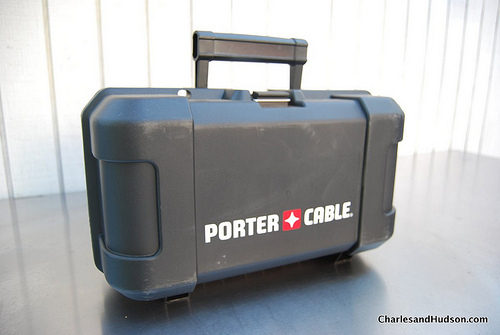 Whatever your project and wherever its location might be, you can trust the Porter Cable name to offer tools built for your specific needs in mind. Although Porter Cable’s compressors have only been on the market for 12 years, the company has seen to it that its commitment to excellence and quality extends to their line of compressors, ensuring maximum performance and safety for its users. There will always be people who can’t resist working on a project even if it’s late in the evening. Whether it’s to beat a project deadline, or because they are only free at night, people can ‘t avoid working on projects that require air compressors when everyone else is asleep. As such, these people become the bane of their neighbors, seeing as how air compressors can be noisy machines. With California Air Tools, however, you don’t have to worry about these issues. The company is a proud producer of ultra-quiet tools that boast of very low noise profile, allowing you to work in environments where people are sensitive to noise. But don’t let their quietness fool you. 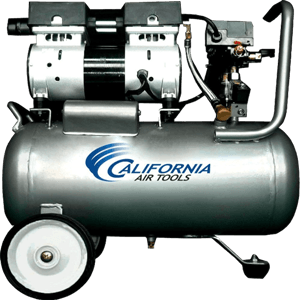 California Air Tools air compressors are built industrial applications, which means they also pack a serious punch in terms of performance. Bostitch is the name you can trust when it comes to and of your construction and DIY project needs. A subsidiary of the mogul Stanley Black and Decker, Bostitch now produces and distributes a broad range of tools built for various applications, whether it’s for home, construction, or industrial environments. As such, Bostitch’s product line has grown to become one of the most expansive and diverse in the entire world. 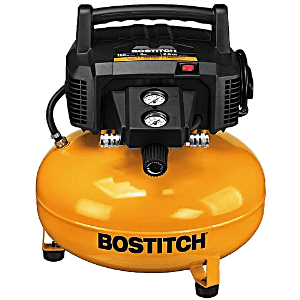 In addition to air compressors, the Bostitch brand has also earned the reputation for producing high-quality pneumatic and hand-operated tools for the needs of the average modern carpenter. Fastening tools are also a part of the company’s portfolio like rivet tools, office staplers, and nailers. Who doesn’t recognize the Hitachi name? 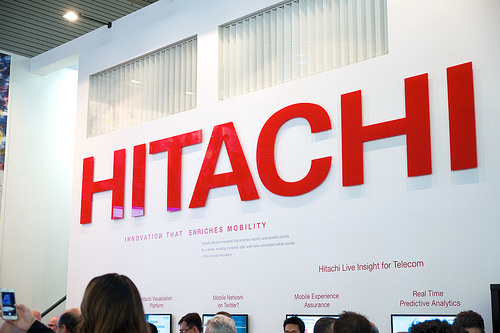 Known as one of the world’s largest conglomerates, Hitachi produces a broad range of appliances, computer parts, consumer electronic devices, tools, and other general machinery. The company is essentially an empire in the world of everyday products targeted towards ordinary consumers. Naturally, the company’s incredibly diverse product lines now include air compressors. And when it comes to these machines, Hitachi does NOTdisappoint. The brand produces some of the world’s most resilient and most durable industrial and home compressors. With a Hitachi compressor in your toolbox, you can breeze through all the items on your checklist, whether it’s a DIY application or a process in an industrial facility. If longevity is your primary criterion when choosing a brand of handyman tools like air compressors and other similar machines, you will appreciate Rolair. What is Rolair’s secret for longevity? For their loyal customers, It would have to be the Wisconsin-based firm’s impeccable meticulousness and commitment to ensuring quality in its product line. As a result, Rolair has consistently produced compressors and other tools that do not disappoint regarding results, durability and, of course, excellence. Grab a Rolair air compressor and see for yourself. Central Pneumatic prides itself for adhering to an extraordinarily stringent Quality Assurance (QA) process. All of the company’s tools and equipment that pass through the Central Pneumatic manufacturing and production facilities must first pass through rigorous testing and certification before they are finally rolled out to shops and stores that carry them, and eventually, into your home. Because of this, Central Pneumatic is confident in the toughness and safety of all tools and products that carry the Central Pneumatic name. You, as a consumer, can expect nothing less than excellence and outstanding reliability from the company’s tools whether it concerns performance, durability, and results in whatever applications they are used in. Thanks to its stringent QA process, Central Pneumatic’s products offer excellent lifetime value for their relatively reasonable prices. Like all tools, air compressors require certain safety equipment and processes. Keep in mind the following safety measures when you’re using a compressor, whether a commercial-grade or consumer-grade one. Keep in mind that while there are compressors designed to be quiet, these machines still give out some noise that could damage your ears after extended use. In addition, certain applications could throw dust or even compressed air back at your face. Ear plugs or commercial-grade ear mufflers that will absorb noise and prevent it from reaching and damaging your ear drums. Face masks that can protect your mouth, nose and the rest of your face from any debris produced when using compressors. Safety goggles or even helmets that can protect your eyes and head from flying debris depending on the actual application of the compressor. Gloves to protect your hands, especially when using the air compressor for spray-painting. When, and how you use your air compressor can be instrumental to your safety as well as in prolonging the life of your machine. Here are some tips to remember as to where you can safely use the compressor, and some points to watch out for in operating the machine. 1. Make sure that the trigger for the hose or other receptacle attached to your air compressor is turned off before you warm up the compressor. This is to prevent accidents caused by unintended blowing of pressurized air from the compressor’s tanks, which could send debris flying towards people or fragile items in the area. 2. As much as possible, use the air compressor in a dry and clean area. Exposing the tank and compressor to moisture can cause rusting in the machine’s metal parts. Rust, if left alone in the compressor, could affect the life expectancy of the tool. Worse, a very rusty air compressor could explode any time. 3. If using the air compressor is a wet area is unavoidable, make sure to empty the tank after turning off the compressor. This will prevent moisture from building up within the tank of your compressor. 4. Check the air compressor before you use it to find loose fittings. Screws and bolts that are not fastened could reduce the amount of pressure produced, which will affect the compressor’s performance. 5. Operating the air compressor in dusty areas can lead to dust and sand getting into the air filter. Make sure to regularly clean the filter to prevent dust accumulation. 6. Avoid exposing yourself to intake air. This air is highly contaminated and could be dangerous to your health. This is not a problem, however, if you wear safety equipment for your face like a mask, goggles, and helmet. 7. Wait for a while before refilling the tank. Conducting a refill immediately after the tank is shut down could increase the risk of a fire, or even electric shock from static electricity left behind by the previous operation. 8. Make sure to plug your air compressor to the right outlet. Plugging into the wrong outlet could damage the electric circuits of the compressor. It also raises the risk of fire. 9. Check also if the outlet is properly grounded, as incorrect grounding could also damage the compressor in the long run. 10. When working as a team, never point any tools towards any person near you especially when you’re preparing to turn on the air compressor. This is also why you need to make sure that the trigger is not engaged before flipping the switch on the compressor. Keep the trigger or nozzle away from yourself as well. Keep it pointed to the ground. 11. Finally, clear the working area of any debris that can be pulled by the compressor into the air tank. The debris can find its way to the tank and impede its operation. Worse, it can cause explosions as well. Compressors are very useful in just about any application. However, their operation needs a lot of safety and common sense. Follow all these security measures to keep accidents, injuries and untoward incidents from ever occurring. We've gone into detail on air compressor safety here if you'd like more information. Buying a compressor can be quite a daunting task especially if you don’t know what to look for, however we hope the above air compressor reviews have cleared up some of the confusion for you. Remember that compressors come in different sizes, types and shapes; the key to selecting the best air compressor is to match it with the job demands and applications to ensure it can deliver on the task.